We made some welshcakes for St David's day on March 1st. They're good...but I'm getting a little bit welshcaked out! a blogger bake off challenge! I'll share the recipe and if you bake them, just post (or leave me a comment) about it and if you want you can challenge others to bake something - a blogger bake off. Blend the nutmeg, flour, and baking powder. Bake each side on a moderately hot bakestone until browned. If you don't have a bakestone (I don't) then you can use a large flat bottom dry fry pan, or do as I do and use the flat plate on the bbq! A great Welsh/Australian combination! It's the best and fastest way. I can whip up about 40 welshcakes in minutes. Beware - they can cook very quickly. 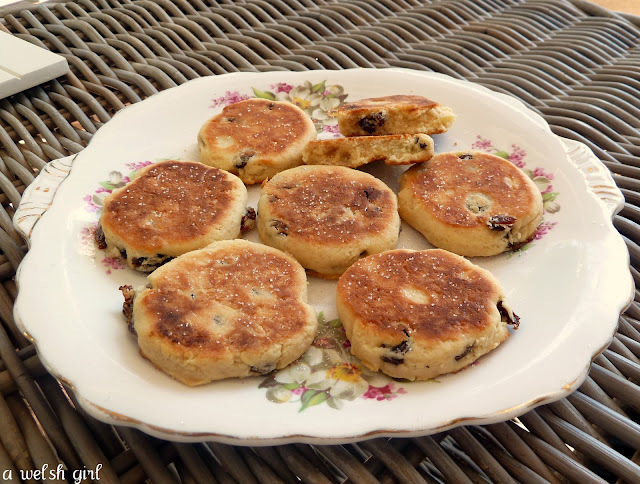 Welshcakes are delicious served warm with a sprinkling of sugar and must be accompanied with a hot cuppa. They are a blend of cake, biscuit and scone. Oh, and they freeze well. I hope you enjoy my little reminder of home - welshcakes. I am an Irish girl married to a Welshman and living in New South Wales since 2005. Another blogger friend in the UK told me about your blog and I thought I would say "Hello"! We too made Welsh-cakes from my Mother-in-laws recipe but they ended up a bit too moist and sloppy and not half as good looking as yours! Byron brought a mountain of them into work with little toothpick Welsh flags sticking out of them and they went down well! I look forward to reading more of your blog in the future! Love the idea of the currants. Ooh they look yummy. I'm a big tea drinker, and think these would go perfectly with a nice cuppa. Yum! Beth, you didn't clean the BBQ! Thank you so much for this recipe! 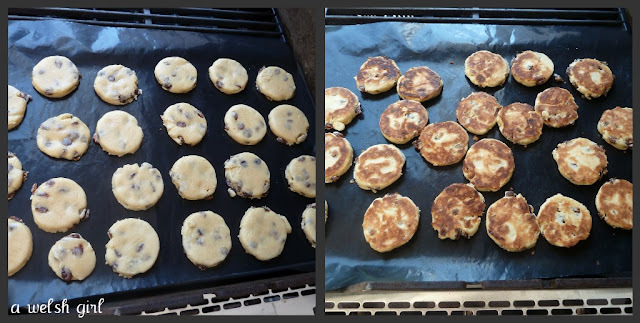 My oven's broken at the moment so I was desperately looking for baking treats I could do on the stove and had forgotten all about welshcakes.